It’s been an interesting season for Fear the Walking dead (FWD). 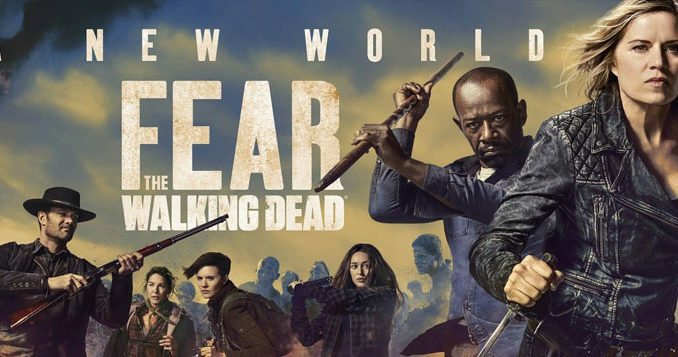 Morgan (Lennie James) joined the group this season literally walking onto the FWD from AMC’s 1st zombie apocalypse show the Walking Dead (TWD). With writers of the show doing a time jump to merge timelines between the two shows. This season added five new characters to the show: Althea (Maggie Grace) – the journalist, John Dorie (Garret Dillahunt) – the friendly ex-cop, June aka Naomi aka Laura (Jenna Elfman) – the nurse , Wendell (Daryl Mitchell) – wheelchair bound survivor and Sarah (Mo Collins) – ex- marine and adopted sister to Wendell. It’s no secret that Fear the Walking dead is not as popular as its AMC counterpart – The Walking Dead. It could be due to the initial premise behind the show wherein they focus on the fall of humanity and the rise of the zombie apocalypse. It later seasons, they focus more on the survivors and their lifestyles than on their original theme. This is probably why the writers decided to do an entire reboot the series with Morgan from the Walking Dead and changing up the entire scenario. To recap the season, it begins with Morgan distraught over events from TWD. He then decides and leaves Alexandria journeying to Texas. His self-excursion eventually leads him to a few new characters that eventually meet up with the surviving group of FWD. In the mid-season finale Madison (Kim Dickens) dies – sacrificing herself to save her colony (although we never really see her die). Which is why the surviving members of the FWD group are hunting their nemesis “the Vultures.” All survivors eventually merge together as a group after the shootout at the stadium. After the mid-season finale, the writers attempted to solidify the group. Using a hurricane that separated the group, the following episodes focused on their adventures in finding each other.